Day one: at the moment we are traveling at 487 miles per hour and an altitude of 38265 ft.
We departed logan at just after 7am and now I think it is about 10:30 or so with the time change. 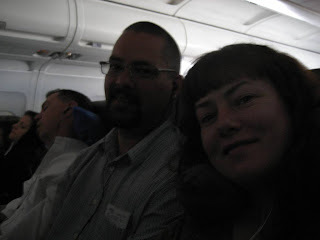 Here we are on the flight to Long Beach just to get on another plane to fly to SLC. We are above New Mexico right now, the northwest corner. I really love Jet Blue. I've been staring at the tiny tv screen in front of me on the channel that has the google map. Scott watched 28 weeks later while I tried to sleep while listening to my ipod. Unfortunately there was a screaming baby for a while pounding on the back of my seat. With the ear popping and noise. I think I managed to get a few winks in. Nick just got us a coffee (they have Dunkin Donut's coffee on the flight, my favorite) Thanks Nick!